HUNTINGTON BEACH – Mexican immigration officials were at Shorebreak Hotel in Huntington Beach on Oct. 9 to discuss and clarify steps anglers and boaters must take in order to fish in territorial waters south of the border. A panel of officials representing various federal departments in Mexico hosted a luncheon with a group of anglers and press members in an attempt to clarify the rules and regulations American anglers need to know and follow in Mexican waters. Mexican officials announced the launch of a website – tinyurl.com/kklv6z6 – to make it easier for anglers and boaters to fill out the necessary paperwork online and obtain approvals before heading into Mexico by way of boat. Once a boater applies for entry into Mexico, they can download the necessary forms to inform Mexican officials of vessel and passenger information via the National Immigration Institute website. Rodulfo Figueroa, who heads the Mexican Federal Immigration office in Baja California, said the tools provided by the Mexican government are still in the process of being refined and everything is still a work in progress, but officials are willing to work with vessel owners as much as possible to ensure the proper laws are being followed. “We’ll get there. Be patient. It’s pretty intuitive. The first thing to do is go to the webpage. Probably the biggest challenge comes in filling out the ship manifest,” Figueroa said, adding the online process would help make it easier to pay registration fees to enter Mexico, improve the administrative process for obtaining permits and reduce ambiguity for those who wish to conduct nautical tourism activities in Mexican waters. Figueroa noted he is working to get all four Mexican states surrounding the Gulf of California – Baja California, Baja California Sur, Sonora and Sinaloa – to cooperate and work together in making the process easier for American boaters. Louis Almeida, president of San Diego Anglers, said progress is being made but more work can be done to make the process easier. Figueroa emphasized it will take time for the process to work itself out. As for the process itself, officials noted a Temporary Import Permit, or TIP, may be requested seven to 60 days prior to entering Mexico. Published guidelines state all approved permits are sent to an applicant within seven business days of receiving payment. Upon receipt of permit, applicants are instructed to send a copy of documents listed in the application either via email, courier or in person. If an angler does not take care of the application process online, they could still port in Ensenada or La Paz and fill out the necessary paperwork at the local consulate office. 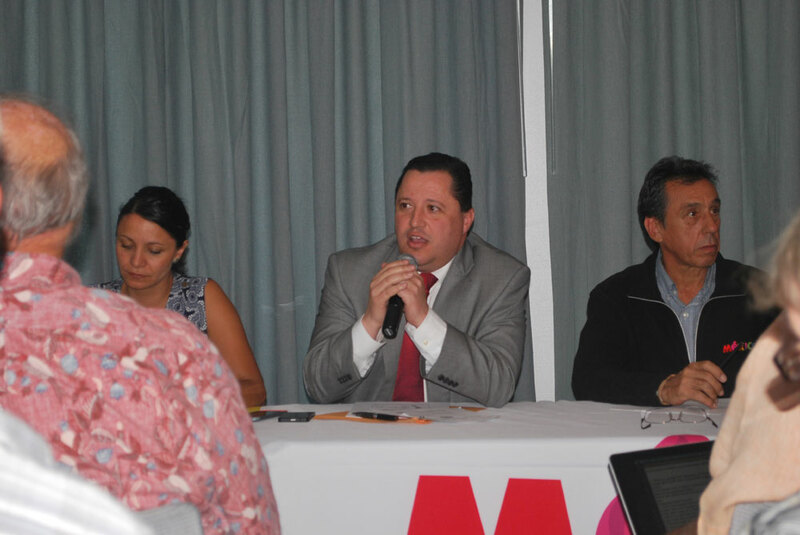 Anglers who have not obtained a permit in advance cannot engage in any fishing activity within Mexican territory until they go to port first, officials said at the Oct. 9 panel. Officials added when filling out the paperwork, boaters are also required to submit a Promise to Return Letter and a List of Goods. The List of Goods attachment should state each accessory and equipment expected to be on board the vessel when it enters Mexico. Whatever comes into Mexico territory must be the same equipment aboard when leaving the country. Ideally, boaters could just list each itemized piece of equipment with its serial number. However, if a piece of equipment does not have a serial number, Mexican officials suggest describing it as best as possible on the application. The list should itemize everything on the vessel that would be used by the boater. Also to be filled out is a spreadsheet with information of the vessel and its passengers or crew members. For those who download the spreadsheet from the website, the spreadsheet would be returned via email. A list of email addresses to send the completed spreadsheet is also available online. An interesting note: each of the passengers and crew members listed on the spreadsheet must enter and leave Mexico together. If any of the passengers or crew members intends to leave Mexico ahead of the rest of the group, Figueroa said it would be best for the entire party to fill out the requisite paperwork separately online or at a port. All United States citizens must carry a valid passport in Mexico. Each boat owner must also carry proper vessel documentation or registration proving ownership or authorization to operate the vessel. Anglers should bring their fishing license. Mexico’s territorial waters extend up to 12 nautical miles from shore or territorial island, meaning anglers who wish to fish in this zone must comply with Mexican laws. TIPs are good for 10 years. If any information in a currently-issued TIP is inaccurate, it must be corrected by Dec. 31. New information could be added to the TIP at anytime. For rules and forms on declaring any fish caught in Mexico and brought into California, visit the Cal Boating website at dfg.ca.gov/enforcement/entry-declaration.aspx.